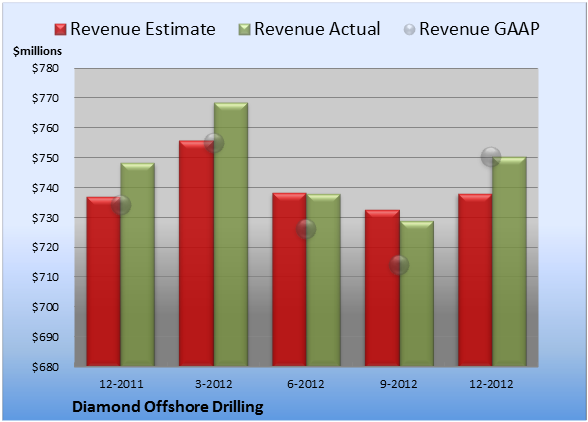 Diamond Offshore Drilling (NYS: DO) reported earnings on Feb. 5. Here are the numbers you need to know. 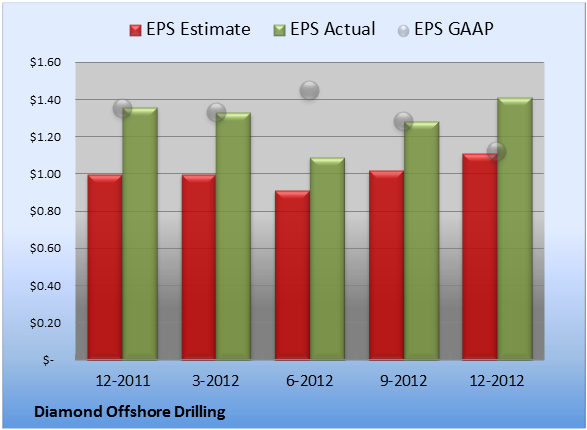 For the quarter ended Dec. 31 (Q4), Diamond Offshore Drilling beat slightly on revenues and crushed expectations on earnings per share. Diamond Offshore Drilling tallied revenue of $750.5 million. The 20 analysts polled by S&P Capital IQ anticipated net sales of $738.1 million on the same basis. GAAP reported sales were 2.2% higher than the prior-year quarter's $734.3 million. EPS came in at $1.41. The 30 earnings estimates compiled by S&P Capital IQ predicted $1.11 per share. GAAP EPS of $1.12 for Q4 were 17% lower than the prior-year quarter's $1.35 per share. For the quarter, gross margin was 49.7%, 510 basis points better than the prior-year quarter. Operating margin was 34.1%, 440 basis points better than the prior-year quarter. Net margin was 20.7%, 500 basis points worse than the prior-year quarter. Next quarter's average estimate for revenue is $743.4 million. On the bottom line, the average EPS estimate is $1.09.  Next year's average estimate for revenue is $3.19 billion. The average EPS estimate is $5.13. The stock has a five-star rating (out of five) at Motley Fool CAPS, with 1,921 members out of 1,965 rating the stock outperform, and 44 members rating it underperform. Among 468 CAPS All-Star picks (recommendations by the highest-ranked CAPS members), 453 give Diamond Offshore Drilling a green thumbs-up, and 15 give it a red thumbs-down. Of Wall Street recommendations tracked by S&P Capital IQ, the average opinion on Diamond Offshore Drilling is hold, with an average price target of $73.87. Can your portfolio provide you with enough income to last through retirement? You'll need more than Diamond Offshore Drilling. Learn how to maximize your investment income and "Secure Your Future With 9 Rock-Solid Dividend Stocks."  Click here for instant access to this free report. The article Diamond Offshore Drilling Beats Up on Analysts Yet Again originally appeared on Fool.com.